When a vehicle’s engine develops a “knock,” most vehicle owners shut down the engine right away or immediately take the vehicle to a service center to be looked at by a qualified ASE certified technician. 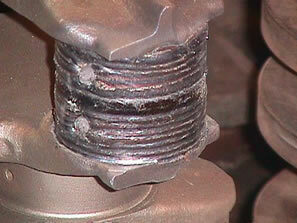 Knocks are often a sign of bearing failure and if ignored, will severely damage the crankshaft journals. In some of these cases, where the journals are so severely damaged that they are unable to be repaired by grinding, a weld is needed to perform the repair. Crankshaft welding is a process by which new material is added to a journal or thrust. This new material is needed because there are only so many available bearings available for a crankshaft that has been ground under its original size. Common oversized bearings are available in .25mm, .50mm and .75mm metric options. Older vehicle engines, which may still use inches for size, may have bearings available that are .010”, .020” and .030”. Since one millimeter equals .0393700787 of an inch, conversion is quite simple with a little math. Regardless, even at .75mm there is only .02952 inches of material that can be taken off of a journal before bearing availability becomes a problem. As with any welding process, a crankshaft must also be properly cleaned to accept a weld that achieves the proper penetration. Often bearing material may be embedded within the journal being repaired, which should be ground out with a crankshaft grinding machine beforehand. Performance crankshafts also may be surface hardened, and this too should be ground out to eliminate the potential for any problems. By adequately preparing a journal or thrust for a weld, the finished weld will be strong and free of defects. Since crankshafts have oil passages that help to feed oil to the bearings during operation, these holes must be adequately protected during the welding process so that they are not welded shut. Often welders use carbon or ceramic plugs that insert into these holes. Other welders choose to briefly stop the welding process as the crankshaft continues to slowly rotate in the crankshaft welding machine’s chucks. Regardless of the technique used, it is important that the oil holes remain free of obstructions. Because crankshafts are made out of different materials, including cast iron and 4340 forged steel, the proper welding flux and wire must be used. Although all-purpose welding wire spools are available that perform adequate welds, a higher quality weld can be attained by using the precise wire for the application so that it is free of cracks and pitting. Wire changes are relatively easy on a crankshaft welding machine since it is spooled. Flux, on the other hand, must be evacuated from the machine and can be more troublesome to changeover. With the proper flux and wire setup for the weld, and the clean crankshaft properly positioned within the welding machine, the crankshaft is now ready to be welded. Welding adds instantaneous heat to a journal, which is not desired. Preheating the journal or thrust is a normal process that most welders use to prepare the crankshaft for welding. A torch is often positioned to heat a journal or thrust as the crankshaft rotates slowly within the welding machine’s chucks. Once the journal or thrust has been preheated, the torch is turned off and set aside so that the operator may initiate the welding process. With the crankshaft preheated and still rotating, and all personal protective devices donned, the operator then positions the wire feed and flux spout to the journal to be welded. The flux, which is often gravity fed, is turned on first and the arc is then initiated to begin the weld. As the crankshaft slowly rotates, the machine feeds the wire at a consistent pace so that a uniform weld can be achieved. Once the journal has made a complete revolution, the operator then uses a chipping hammer to remove the flux that surrounds the weld. Known as slag, when it is chipped away it is caught by the welding machine’s slag tray. The slag tray also doubles as an unused flux recovery system. The machine is then manually or automatically adjusted to add a bead across the remainder of the surface to be welded. You may view a finished journal weld by viewing the picture to the upper right. A thrust weld is accomplished in the same way as a journal, with the exception that the bead is instead applied vertically instead of horizontally. In most cases, it is the rear thrust surface that is welded as this is where they are most often damaged. As with any operation involving the welding of steel, intense heat often produces some bending. 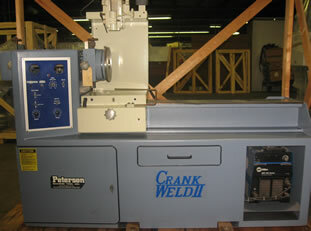 It is not uncommon to weld a crankshaft that bends .020” or even more. Because of this, the welded crankshaft should be straightened after it is allowed some time to cool. If the crankshaft is still hot, it can be straightened much easier than if it were cool to the touch. In most cases the applied weld is harder than the original surface. Once the crankshaft is cool, the welded journal should be pre-ground in the crankshaft grinding machine to within .020” of its finish size. Since pre-grinding will relieve some of the stress in the steel, especially from removing the weld within the radii, it is necessary to check the crankshaft for straightness again. While the crankshaft is being checked for straightness again, most likely in a set of v blocks, it is wise to inspect the oil passages. If any obstructions in the oil passages are observed, a die grinder can be used to remove any burs that would restrict oil flow to the bearings once the crankshaft is finished and installed in the engine. With the crankshaft straight, and the welded journal or thrust roughed in, it is now ready for the finish crankshaft grinding process. Although welding is most often used to repair damaged crankshafts, this process is also used to increase the stroke on performance crankshafts. However, modern day aftermarket stroker crankshaft options have made the need to create stroker crankshafts from welded journals less popular. It is our hope that the information contained within this page has allowed you to learn how the crankshaft welding process is performed. Please take this opportunity to rate this page below so that we may better serve the needs of our visitors and those who want to understand more about their crankshaft repair options. This entry was posted in Welding on August 3, 2013 by admin.